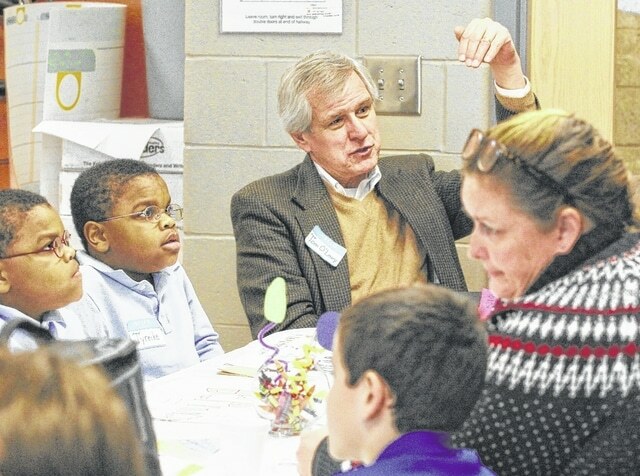 GALION — Students and staff at Galion Primary and Galion Intermediate schools welcomed community leaders to their first Leader in Me luncheon Tuesday. The Galion schools are among the most recent across the nation to take part in the Leader in Me effort. Tuesday’s luncheon was a way to show appreciation to the community and its leaders for the support they’ve shown for what is hopefully a life-changing program for staff, students and the community. It is also a step forward in building this community’s next generation of leaders. Students were greeters as guest arrived and then were able to sit and chat with the guests and talk about leadership qualities and about leadership in the school and the community. It was a way to get students to take more ownership in the Leader in Me effort. “They were opportunities to plan menus, entertainment, decor, develop guest lists and prepare talking points. Students can showcase all of their talents and skills, not just those that are typically expected to be seen in a school setting,” she said. Guests for this first Leader in Me luncheon included community leaders from Galion and Crawford County who have been critical in helping the program be successful. “This leadership luncheon is one way of showing that all of this is making a difference in the lives of our students,” said Superintendent Jim Grubbs.